In the company of good friends on a chilly Sunday afternoon, the tables on my deck were filled with plates of cheeses, tomato drizzled with olive oil, mozzarella and basil leaves, and dip and chips to munch on, as well as three wine glasses filled with Mirassou 2011 California Merlot. The oaky flavors and smoky aroma felt right in keeping with the cool weather. One guest went so far as to rate it “85” points, which I can only assume referred to Parker points. Flavors from this merlot are red cherry, raspberry and vanilla. Made with grapes from the Central and North Coast of California, it’s no surprise this young wine offered such deep, wonderful concentrated flavors. Two glasses were saved for dinner of charcuterie and red sauce over pappardelle pasta — it worked. Next, I opened a bottle of Mirassou 2011 Cabernet Sauvignon. This wine, my deck friends stated, had “impressive legs” and a fruity, hearty bouquet. It was a smooth wine with a full-body and perfect finish. The grapes of this wine hail from California’s Central Coast, Lodi and several North Coast regions. The longer growing season results in the more expressive flavors. 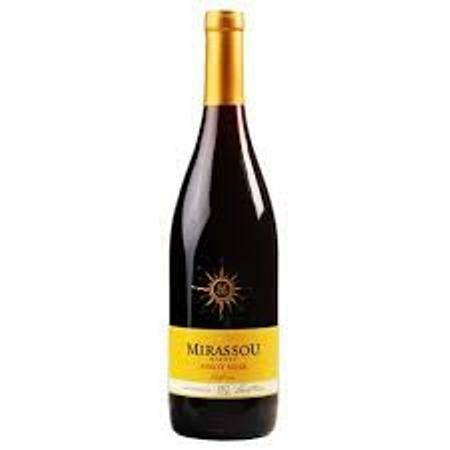 Now for the Mirassou California 2011 Pinot Noir, made by David Mirassou, sixth-generation winemaker whose great-great-great grandparents, Pierre and Henrietta Pellier traveled from France to California to find gold — and in a way they did — but in the form of vineyard potential. From France, they preserved their pinot noir cuttings in potatoes they purchased on-board the ship, and due to this creative thinking, the first pinot noir grapes entered California. The process in growing and harvesting pinot noir grapes is delicate and intricate, so this is a wine to be appreciated if not for its fruit-driven flavor profile of cherries, strawberries and red currant, but by the process to create such a wonderful wine. Follow Mirassou on Facebook: www.facebook.com/mirassouwinery or visit www.mirassou.com for more information. Each of these three wines retails for approximately $12 a bottle.